After weeks of teasing from series co-creator Ed Boon, today the name of the next game in the legendary fighting game series has been revealed: Mortal Kombat X. Update 11:20 — added platforms and gameplay details from the official press release. 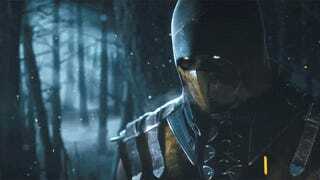 As seen in the vague but delightful first trailer, Mortal Kombat X will arrive in 2015. According to the trailer's YouTube flavor text, the game's being powered by "next-gen technology," which has me thinking Xbox One and PlayStation 4. With the success of the 2011 Mortal Kombat reboot and 2013's Injustice: Gods Among Us, we've got two solid reasons to be very excited about a new game from NetherRealm Studios. Mortal Kombat X combines cinematic presentation with all new gameplay to deliver the most brutal Kombat experience ever, offering a new fully-connected experience that launches players into a persistent online contest where every fight matters in a global battle for supremacy. For the first time, Mortal Kombat X gives players the ability to choose from multiple variations of each character impacting both strategy and fighting style. Players step into an original story showcasing some of the game's most prolific characters including Scorpion and Sub-Zero, while introducing new challengers that represent the forces of good and evil and tie the tale together.